My eye is dazzled regularly by the Tuscan light. A light that caused us many years ago to name our book on the region; “Tuscany: Inside The Light,” because it so often seemed as if the light was emanating from within the landscape rather than falling on it. There is something very special in the composition of the soil here which I believe contributes to this light effect, and my reading of it this way. The earth here is not the typical dark earth of many agricultural zones. This earth is known as the Tuscan crete, which is a light toned, clay-like material deposited millions of years ago as sea bottom, and as such it is incredibly nutrient rich, but not dark. I believe that this light toned earth forms a base below the grasses, grains, sunflowers, vineyards, etc, that are part of the landscape here. This produces a more reflective surface than a dark soil does, and so there is a luminous lift to the light bouncing back from the land, which I believe is what generates the special qualities of Tuscan light. Certainly daily atmospheric conditions emphasize light and color as well, but from my 20 year point of view working here, it is the accumulated resonance of this scattering of the light that accounts for these remarkable and emotional displays. 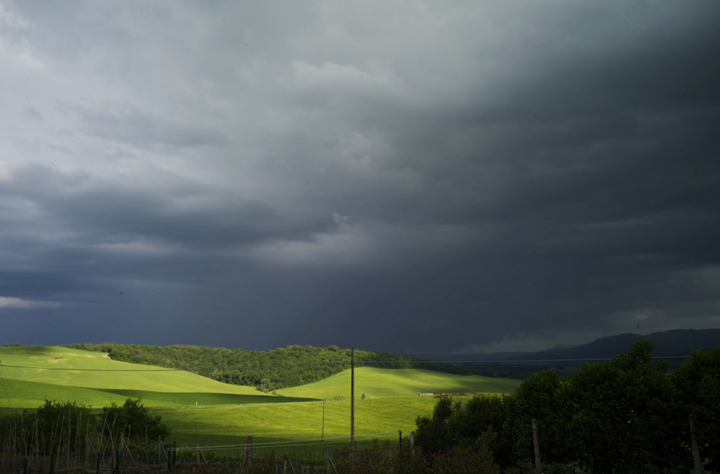 This entry was posted in Light, Tuscany and tagged Landscape, Light, Tuscany on May 12, 2015 by joelmeyerowitz2014. seen images that had the same lighting: but these were paintings by Dutch artist Nelly van Nieuwenhuijzen (http://www.nellyvannieuwenhuijzen.nl/kunstwerk/140345151_Zeeland+090514.html#.VVJfDZM0TGg) that is in the province of Zeeland, The Netherlands. On the other hand: it’s clay bottom, stemming from the sea.